Rudder is an easy to use, web-driven, role-based solution for IT Infrastructure Automation and Compliance. 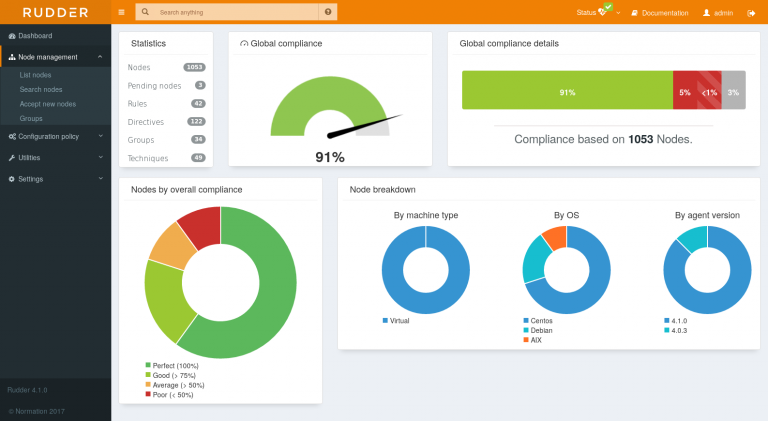 With a focus on continuously checking configurations and centralising real-time status data, Rudder can show a high-level summary (ISO 27001 rules are at 100%!) and break down noncompliance issues to a deep technical level (Host prod-web-03: SSH server configuration allows root login). A simple framework allows you to extend the built-in rules to implement specific low-level configuration patterns, however complex they may be, using simple building blocks (ensure package installed in version X, ensure file content, ensure line in file, etc.). A graphical builder lowers the technical level required to use this. Each policy can be independently set to be automatically checked or enforced on a policy or host level. In Enforce mode, each remediation action is recorded, showing the value of these invisible fixes. Rudder works on almost every kind of device, so you’ll be managing physical and virtual servers in the data center, cloud instances, and embedded IoT devices in the same way. Rudder is designed for critical environments where a security breach can mean more than a blip in the sales stats. Built-in features include change requests, audit logs, and strong authentication. 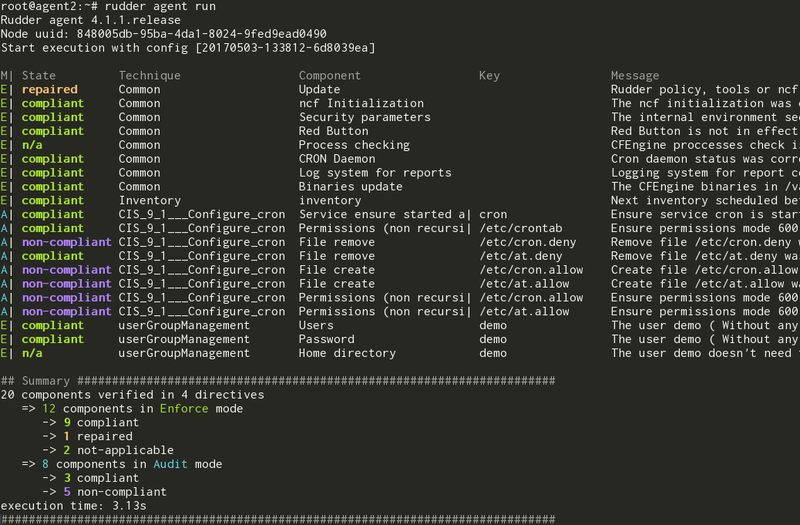 Rudder relies on an agent that needs to be installed on all hosts to audit. The agent is very lightweight (10 to 20 MB of RAM at peak) and blazingly fast (it’s written in C and takes less than 10 seconds to verify 100 rules). Installation is self-contained, via a single package, and can auto-update to limit agent management burden. Rudder is an established project with several 10000s of node managed, in companies from small to biggest-in-their-field. Typical deployments manage 100s to 1000s of nodes. The biggest known deployment in 2017 is about 7000 nodes. We believe that there is a growing impedance mismatch between the Short Time of application development and deployment, and the Long Time of the infrastructure. The latter need rationalisation, stability and conformity before catching the hyped techno of the day, to be able to deliver reliable technical platform, continuously working with a minimum of risks. Rudder was made for the Long Time, to help team deliver efficient infrastructures with simplicity, giving them feedback where needed, keeping them alert of possible incoming problem, continuously checking conformity to their rules, and all of that whatever the infrastructure they choose to build. To achieve these goals, Rudder goes beyond simple automation of commands or configurations. 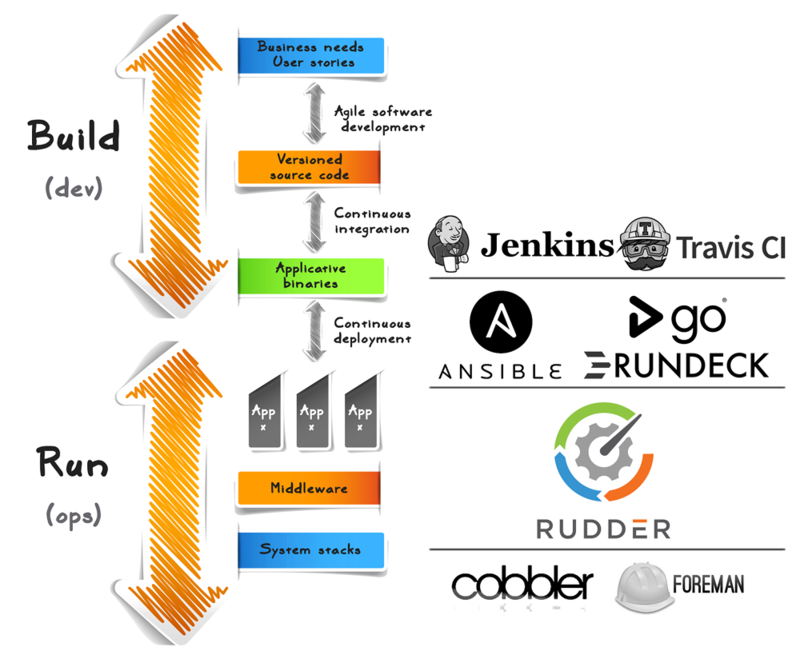 Rudder continuously maintains your infrastructure to keep it conform with your configurations and security rules. At each level (global, by configuration policy, by node, etc), you can choose to either Audit the component - and no modification at all will made on it -, or to Enforce the policy, automatically correcting a drift if needed. Rudder was thought from the start for plug&play-ability: easy to install and to upgrade, easy to start with and growth with. Rudder comes with a graphical interface, a standard library of configuration policy ready to use, and a graphical rule editor. Developers can script Rudder through its APIs and security teams can check conformity level to their policies or inventory (both software and hardware) of a server at any time. Rudder agent is extremely fast, light, and versatile. It works on a wide variety of OS or hardware, from physical server to cloud instance, user laptops or even Digital Cities and IoT objects.